Live From London: Vineyard Music EXTRA! Talk about a life-changing album! 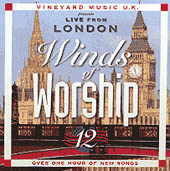 From the moment I first heard Winds of Worship #12, I was electrified. Apart from the hair on my neck standing up, I just wanted to fall on my face, jump, raise my hands and shout  anything to be part of the splendourous worship entered into by the team from the UK. I was once, a long time ago, very sceptical about the quality of music and musicianship in the church. It was largely Vineyard music, and albums like this in particular, which made me change my mind. I have also always enjoyed the feel of the Winds of Worship series, which generally presents music in its raw form  as it was performed or originally written. But even among the Winds of Worship albums, not all have this edge to them. There is something special, passionate about a live recording, and the guys in London have come up with something exceptional here. It comes with the legacy created by albums such as Live from Brownsville, and the stark, almost jagged passion in the awesome vocal worship of Wendy Whitehead cannot but pierce the hardest of hearts, and must be on my list of top three favourite female vocal worship recordings. This album has given me new zest for leading worship, not to mention some great new material to work with!